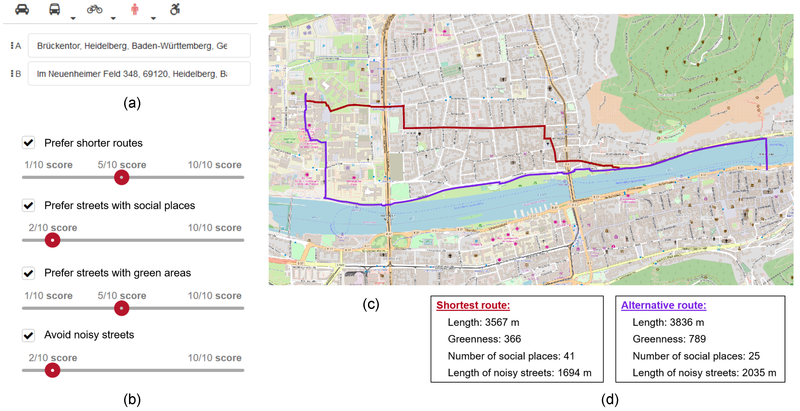 In a newly published open access paper, we present a system that generates customized pedestrian routes entirely based on data from OpenStreetMap (OSM). The system enables users to define to what extent they would like the route to have green areas (e.g., parks, squares, trees), social places (e.g., cafes, restaurants, shops) and quieter streets (i.e., with less road traffic). We present how the greenness, sociability, and quietness factors are defined and extracted from OSM as well as how they are integrated into a routing cost function. We intrinsically evaluate customized routes from one-thousand trips, i.e., origin–destination pairs, and observe that these are, in general, as we intended—slightly longer but significantly more social, greener, and quieter than the respective shortest routes. Based on a survey taken by 156 individuals, we also evaluate the system’s usefulness, usability, controlability, and transparency. The majority of the survey participants agree that the system is useful and easy to use and that it gives them the feeling of being in control regarding the extraction of routes in accordance with their greenness, sociability, and quietness preferences. The survey also provides valuable insights into users requirements and wishes regarding a tool for interactively generating customized pedestrian routes. An important feature of the system is that it allows users to interactively define the weights of these factors in the extraction of the customized route. The system also informs users about the length, greenness, number of social places, and total length of noisy streets of the shortest and customized routes. This enables them to make a more aware decision on whether to take one of the two routes or to further edit the factor weights. In our opinion, such an user-system interaction is important to the extent that pedestrian route choice is subjective and dependent on the circumstances at the moment of the route request. We also presented the prototype of the system’s interface that is already integrated into OpenRouteService (ORS), a widely used open source web-service for several navigation purposes based on OSM data. ORS includes several research results, e.g. for the here explained healthy green & quiet routing, but also Landmark based navigation, routing across open spaces , wheelchair routing for all of Europe and more. All this blends to earlier work and concepts on adaptive and personalized GI services (maps, routing, and navigation). While some ideas have already been developed in the late 90s and early 2000, due to the availability of VGI these ideas can now be brought into practice and evaluated scientifically. Neis, P. & Zipf, A. (2008): Generating 3D Focus Maps for the (mobile) Web – an interoperable approach. International Journal of Location Based Services (JLBS). Vol. 2(2). Zipf, A & Jöst, M. (2005): Implementing Adaptive Mobile GI Services based on Ontologies – Examples for pedestrian navigation support. CEUS – Computers, Environment and Urban Systems – An International Journal. Special Issue on LBS and UbiGIS. Pegamon Press, Elsevier.